Open Gate’s experienced teachers plan our curriculum, lead our children’s classes, and facilitate our parent education program. They enrich our community with their enthusiasm, wisdom, and passion for early childhood development. Teacher Kristi has been teaching the Multi-Age class and Pre-K programs at Open Gate Nursery School since 2003 and became Open Gate’s director in 2006. One of Teacher Kristi’s favorite things about teaching this age group is introducing the 3-4 year olds and their mommies and daddies in her class to the wonder and excitement of Small Groups. 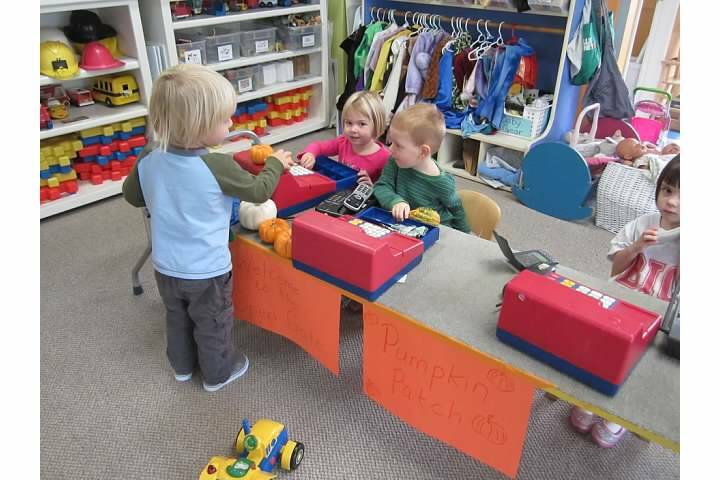 These structured lessons are some of a child’s first experiences sitting with a small group of his or her friends and engaging in curriculum taught by Teacher Kristi and the working parents in fine motor, large motor, language and literacy, science, mathematics and social interactions. Teacher Kristi has a BS from Colorado State University in Human Development and Family Studies, an Elementary Education credential, a Montessori 6-12 year old credential, and an Adult Education Credential. Prior to coming to Open Gate, she taught preschool and Kindergarten in Colorado, and eight years of upper Elementary Montessori education in Napa and Berkeley. After 28 years at Open Gate, we wish Teacher Lori a happy retirement!